2mm Dense Foam Black 17" x 27"
Black 17" x 27" Sheet of 2mm High-Dense Foam. Increase the structure and detail of your embroidery design using High-Density 3D "Puffy" Foam! Embroidery using standard density foam results in a smooth, rounded-edge detail on the raised design. 3D Dense Foam will enhance your design with crisp edge details and appear comparatively taller. 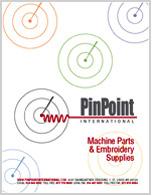 Embroiderers like the clean-finish results with less loose fibers. Select a foam color to closely match your thread for best visual coverage in your design. Special digitizing is required for all designs and the embroidery operator must use a satin stitch machine setting. 3D Foam is non-toxic, water resistant and machine washable. Foam is flammable and cannot be dry-cleaned. Tell a friend about 2mm Dense Foam Black 17" x 27"